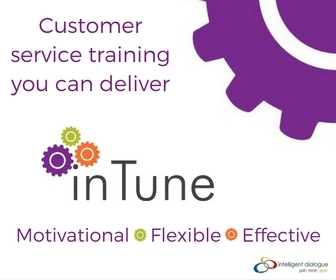 We're really excited because our friends at Intelligent Dialogue have been busy creating a series of customer service training materials which can be used to deliver your own employee training sessions. They're called In Tune and we like the idea of people being in tune with their customers. Designed to be one hour long, each module can be used as a single course, or additional modules can be added to build a comprehensive customer service training library. Why not run the sessions in team meetings, over lunch breaks in lunch and learn sessions, or in team building sessions to reinforce key customer service messages? There are also tips and ideas included that enable you to make the sessions more in-depth, or more tailored to your organisation, your people and your customers. These customer service training materials are easy to use. The Trainer's Guide has clear step-by-step instructions to follow, and have been put together so that you can run a training session with the minimum amount of preparation. They're so simple to run, that both team leaders or trainers can use them to run customer service sessions. PowerPoint Presentation to support key messages during the training session. What we say and how we say it matters to customers, help delegates think about what they say and how they can phrase it more positively for the customer. A key module to help people understand their customer's needs. Help your team calibrate the level of service they give - is it ordinary or extra-ordinary. Where do you need it to be? Help customer facing people understand the power of language and speed at which we speak in building rapport and relationships with people. This module concentrates on this essential and underutilized customer service skill. A module which focuses on participants motivators, and how we can motivate someone to do something. Great as part of team leader development, or for team leaders to run in team meetings so that they can tune into what motivates their team. There's real depth to this multi-faceted module. A simple but highly effective module which helps people to focus on the positives. Highly motivational this module is great for team leaders to run in their team meetings.